This is an interview with Kathryn Thomas. Before training as a yoga instructor, Kathryn was a Naval Officer and Naval Aviator flying SH-60 helicopters. She suffered a permanently disabling non-combat related injury in 2011, and was medically retired from active duty in 2013. She moved to Kailua, Hawaii, to join her husband in 2012, and rediscovered yoga as a means of coping with the emotional and physical challenges of her injury. “My practice gave me new direction in life, and aided me in overcoming the loss of my career in the Navy,” says Kathryn. Rob: What originally motivated you to bring yoga into correctional facilities around Jacksonville? Kathryn: My intent was to extend the mission of the Hawaii Yoga Prison Project to my new community. When I first started in Jacksonville, I wanted to serve the correctional facility population exclusively. Statistics released by the U.S. Department of Justice in 2013 show that Florida has the third largest number of inmates in the country (after Texas and California), excluding federal inmates. These statistics also point out that as of 2012, 1 in 35 people in our nation is either incarcerated, on probation, or on parole. I believe the programs that have been going into the correctional system for years (e.g., Alcoholics Anonymous, Religious Services, Narcotics Anonymous) have made a difference, but yoga brings a new element that is not currently available to the majority of prisoner populations in the country. It provides another tool to aid prisoners in relieving stress, controlling emotions, learning impulse control, and getting them in tune with their bodies. Please tell me about your organization’s overall purpose and mission. After working for so long with prison populations, I realized that yoga can benefit people who otherwise may not have access to the benefits of the practice. For instance, it can help at-risk individuals struggling with many of the same challenges as people in the corrections system. My hope is that practicing yoga can give at-risk individuals a greater chance of avoiding incarceration in the first place, thereby reducing the prisoner population in the state. This is why the mission of Yoga 4 Change is to promote healthy living, and foster self- confidence in veterans, inmates, at-risk youth, and those suffering from substance abuse. Individuals in all four of these groups need help dealing with trauma and overcoming personal tragedies and challenges, and by making the practice of yoga available to them, we are offering a tool to aid in avoiding the behaviors and actions that often result in incarceration. What is the importance of mindfulness for developing impulse control? How does this help life inside a correctional facility? Meditation calms one’s mind and decreases stress, allowing a person to develop necessary impulse control. I’ve walked into correctional facilities where the men and women are under constant stress; even the smallest issue will send them into a fit of rage. By practicing yoga, the inmates and juveniles learn to calm their thoughts, and focus on themselves. The coping techniques they practice in yoga can be employed once they are released to society, giving them a means of dealing with stress that they may not otherwise have had. These techniques can also aid them while still incarcerated, offering the inmates a means of dealing with stress and adversity that could help avoid violence and its consequences. Instead of being controlled by their emotions, inmates learn to take a breath and come from a place of calm. If part of the mission of the correctional system in America broadly is to rehabilitate offenders and prepare them for reintegration into society, inmates should be provided with a variety of tools to avoid repeating the behaviors that landed them in prison in the first place. Yoga brings a new element to existing outreach programs and can reach individuals who have not responded to other forms of therapy. Funding yoga in correctional facilities can ultimately save real dollars by reducing recidivism rates and decreasing the overall prisoner population. Yoga has been said to help those with addictions. I want my tax dollars to be paying for shorter jail/prison sentences with inmates, not getting years added to their sentences due to fighting or violence. Ultimately, yoga may not be the solution to all problems within the correctional system, but it has significant potential to make real and lasting positive changes in the lives of prisoners. What is the greatest challenge in mindfulness classes becoming a regular feature of the facilities you work in? The greatest challenge has been getting the word out about what I’m trying to accomplish, and obtaining funding to meet those goals. With the growth in interest and demand among various institutions and organizations in the Jacksonville area, finding and recruiting qualified and motivated teachers is now a primary focus of Yoga 4 Change. When teaching yoga to prison/jail populations, approach all situations with your eyes open. Creating a safe, judgment-free environment for the inmates is a powerful experience, but at the same time you need to be cautious. Take care to treat your students, regardless of institution or venue, as human beings, and not let expectations and prejudgments govern your approach to teaching. Remember also that inmates are under a great deal of stress, so reaching a state of calm, and learning to quiet their minds may require time and practice. As a teacher, I consider it my job to guide them in their yoga practice, treating them as fellow humans instead of criminals. What should prison administrators know about the work you are doing? I wish to emphasize that nothing I teach is religious in nature. I’m not teaching in Sanskrit, nor am I having students chant mantras. Instead, my teaching is based on everyday principles: forgiveness, love, respect, gratitude, and happiness. Many of the inmates I teach do not understand some or all of these concepts, and I hope to change that. Above all else, I’m seeking to offer services that will improve the rehabilitation process for incarcerated persons and reduce recidivism rates, thereby directly aiding the administrators of the correctional facility in their primary mission. 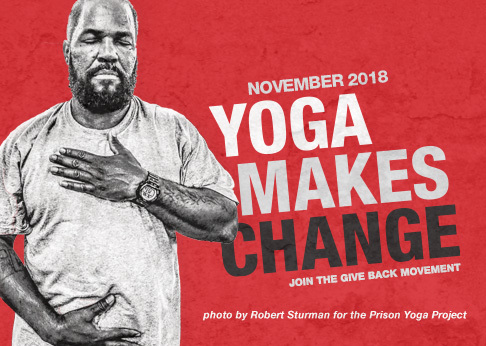 I believe yoga can be a powerful force for positive change in the lives of many people, whether incarcerated in correctional facilities, suffering from combat-related illnesses, or struggling with addiction. It is ultimately my goal and passion to bring yoga to those who stand to benefit the most from its teachings.